My story is about my best friend Cristal, who is someone I’ve known for the past 7 years now. Out of nowhere her life completely changed after things started to happen to her body in the month of December of 2008. She started to get rashes and swollen all over her body. Her thinking of it being an allergic reaction, she went to the doctors and they gave her medicine and told her she would suddenly get well. As time went on, she continually got rashes and got swollen, and apparently the medicine she received from the first doctor wasn’t working so in the month of January of 2009 she went to about four different doctors and the all didn’t know what it was. She ended up getting a big rash on her left knee and it looked like something bit her because it was red and really swollen and she couldn’t walk. So the search began, since it was getting worse and worse as days went by. She went to her fifth doctor, he ran some studies like blood work etc. and he found what was wrong! This is what she told me that he said “I would hate to tell you this since you’re so young but I believe you have lupus.” She had no idea what it was. She just took the medication the doctor gave her called cortisone and told her to stay away from the sun etc. She was good till March. 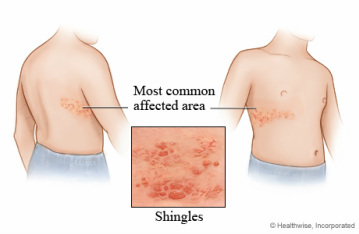 Her last time she got sick was the worst, in Oct 4th; her rheumatologist told her because of her stress and weakness of her immune system made her get shingles, like she said “aka the worst pain of her life”! They gave her strong pain killers and other medicine to make it go away since it’s contagious. I guess the medicine didn’t really work either! So some lady recommended her to go to a nutritionist doctor and he was the one who figured out her allergies to gluten foods, wheat, flour, dairy, etc. 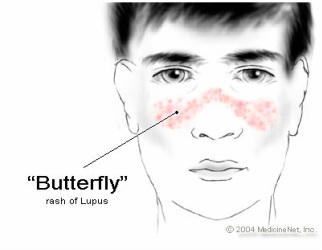 She says if it wasn’t for the nutritionist doctor she would have the famous lupus butterfly rash on her face all the time. She then received some type of shots for her pain itchiness and other things. It was 12 shots, 6 on each side of her spinal cord, and sooner or later that didn’t help either. She went to her last and final doctor who cured her shingles by putting some type of cream and medicine, and water that made it start to scab up. Her symptoms are tiredness, swelling, mood changes, rashes, and the famous butterfly rash on her face, headache, joint pains and much more. She doesn't eat any dairy products, soy, flour, wheat, and foods that she does eat is rice, rice milk, rice cheese, rice pasta, rice bread. It helps her by not rashing up so bad. up every day with pain, my bones ache, as I get up and start walking, every single bone in my body starts to crack, feels like they’re going to break, but I don’t let it defeat me. I continue my daily schedule. I keep my pain to myself, no need for anyone to feel sorry or bad or anything. I’m going to continue my life, as strong as I can good or bad days; I’m showing lupus whose boss!"